Two months. No sewing for two months. It´s horrible. I´ve gone through the cold-turkey sweats, the anguish, the dull ache of yearning, and still the pain of loss refuses to die. Two months, people. 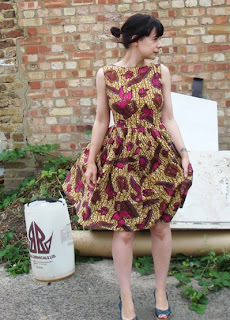 This amazing African print dress was made by a girl from London using a vintage dress pattern. More on this dress can be found here. Let me explain. It´s not just jealousy that is stirred, although I would be the first to admit that that emotion is very present. It´s like this: I love African fabric and had been using it more and more before I left for Barcelona (and temporarily left my favourite passtime). I also have a vintage pattern addiction, and have for some time thinking I should start wearing more dresses. Now I´m not saying that, given time, I would have inevitably have conjured up a similar creation, it´s just all these elements in one amazingly executed example of home sewing is just a bit more than my fragile heart can bear! I´m heading back to the UK in a couple of weeks and have set myself the challenge of making a new creation whilst I am there. I won´t have enough time to produce a dress, but I predict the pains will cease for a while. How good is sitting around?! Normally I´ve got heaps of stuff to do. However, my present combination of unemployment, lack of sewing machine and computer and Top Gear repeats, it being too hot and the general Barcelona social culture has meant I´ve been clocking up the sitting-around-hours with ease, both on my own and with friends. In fact, there are so many cafes and bars here that I seriously question how the economy can support them all. Subsequently, I believe frequenting my favourites ones is a duty that I cannot shy away from, for fear of them closing. This happened in Nottingham, when the K9 Cafe closed down whilst my back was turned when I was in New Zealand. I´m not letting that happen again. Not on my watch. In the image above I am chilling with some crew in a nice cafe called Babel in the Gottico area. And yes, I did make that blouse, thanks for asking. From a one pound table cloth as a matter of fact. Sitting on my arse has recently resulted in some major ideas generation and discussion. All sorts of creative plans and projects are subsequently afoot. However, this inspiration could also be the result of the three electric shocks I have sustained from my bathroom this week. Either way, watch this space!